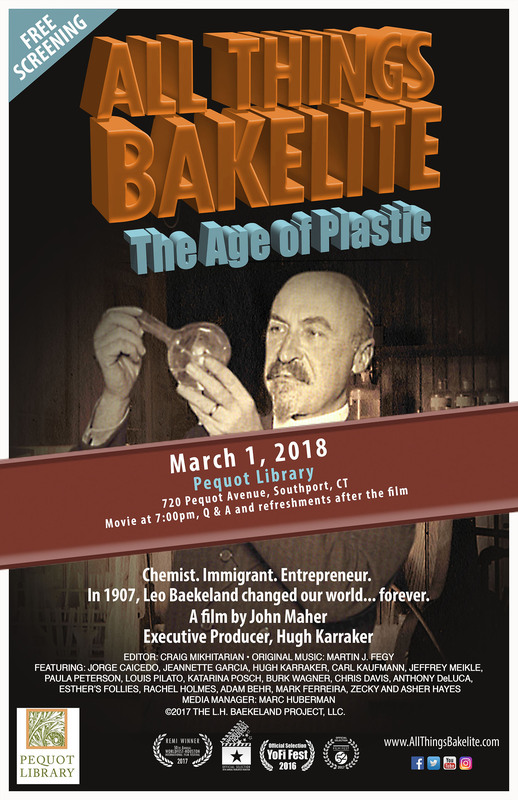 On March 1st, the screening at the Pequot Library in Southport, Connecticut was tremendously gratifying. The audience of 65, were enthralled and asked challenging questions during the Q&A. Some technical and philosophical questions were answered by Edward Werner Cook, chemistry professor at Tunxis Community College in Farmington, CT.
For the past two years, Professor Cook has been showing our film to his students. Thank you Edward for participating at our screenings and for your ongoing support. We thank Tracy Steneken, public program manager at the Pequot, for organizing and hosting the screening. It was a pleasure working with you, Tracy. Gwen and Parker Ackley’s antique car, seen in our film, was on display in front of the Library. Mike Ciulla, who opens our film with the line, “What is Bakelite,” attended. Thank you all for coming. It’s interesting to note that later in his life, George Baekeland, Leo’s son, lived in Fairfield, Connecticut. He contributed generously to the Pequot Library.